We all want to protect the environment and have the most energy efficient home we can, but most people assume going green means an extra-hefty price tag, longer construction time, or they will have to compromise on durability. This simply isn’t true when it comes to ICF or Insulated Concrete Form homes. 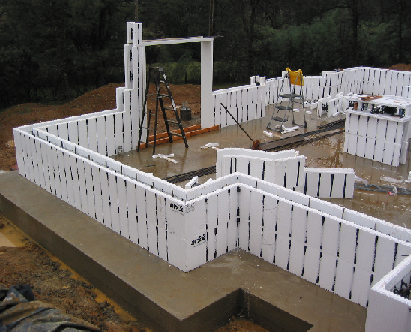 ICFs are interlocking foam forms that are filled with concrete and rebar. These allow for a wide range of building options, are long-lasting and durable, and can save you money in the long run with their energy efficiency. 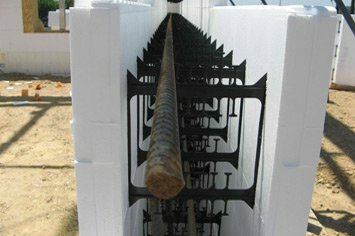 An ICF is characterized by two parallel pieces of foam held the correct distance apart by regularly spaced braces. The space between the foam pieces is then reinforced with rebar and the concrete is poured in. The thickness of the concrete inside the frame typically ranges from four inches to a foot or more. The thickness of the walls helps determine the energy efficiency and strength of the building. Thicker ICFs are used for large commercial buildings or in areas that experience extreme temperature fluctuations. The foam pieces of the form are usually a couple inches thick themselves to add structure and create another natural barrier between your beautiful new home and the great outdoors. Because the form locks together during construction and stays in place afterwards, it provides such a tight barrier that no additional insulation is needed; simply put up drywall on the inside and plaster your preferred exterior directly to the outside of the form. 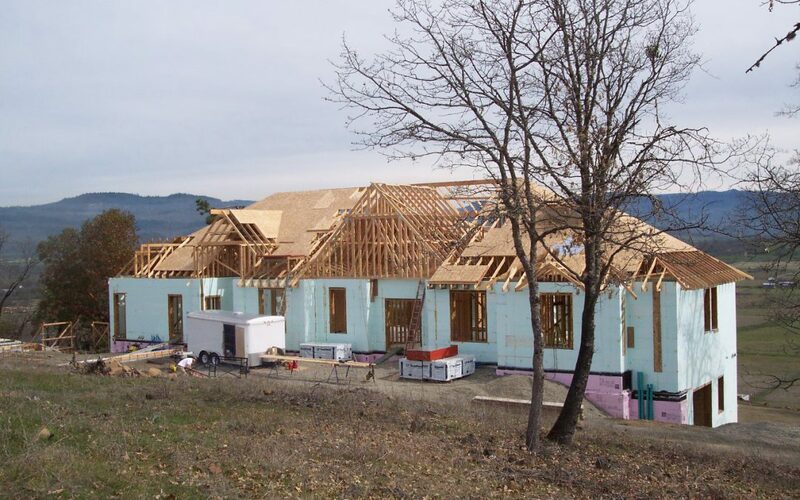 ICFs don’t tend to cost a lot more initially and what little they may add in material costs, they tend to save in other construction costs, as well as long term heating and cooling savings. The concrete poured into the forms creates a gap-less wall, keeping out moisture and lowering the inside/outside air and heat exchange of the home. You can expect a 50-60% reduction in your heating and cooling costs, saving you thousands in a short time. The material does not decay and concrete itself has many benefits over a traditional wood, brick, and mortar home. Concrete is not susceptible to bugs, termites, or other creatures making their homes within your walls. Concrete can also withstand flooding and has no chance of growing mold or rotting afterwards. Concrete has a natural ability to withstand the elements so it adds durability to homes in hurricane, tornado, or earthquake prone areas and far exceeds the minimum building requirements and codes in these areas. And of course, concrete doesn’t burn so the fire risk of your home is lowered dramatically. All of these factors can help lower your insurance rates, saving you money in yet another way. The ease of installation means fewer workers are needed, the stress on the workers is lessened, the construction has a smaller impact on the environment (less heavy machinery needed), and results in a large reduction of construction site waste. Concrete can also be poured in a wider range of temperatures so your building timeline is not delayed by weather. The ability to cut the form into any desired length and shape means ICFs are great for building curved walls or other interesting architectural elements. It is also the ideal material for creating basements, particularly finished basements, as it is superior to traditional leaky and cold basement building materials. Don’t worry, you won’t be left with an ugly grey concrete house at the end of it; ICFs are generally finished with stucco or brick facades to match your preferred aesthetic. 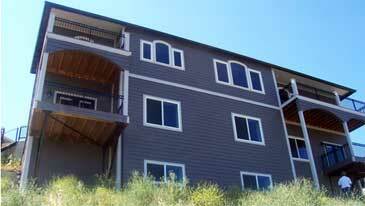 There is every benefit in the world to consider an ICF home or building for your next construction project. Find your local ICF professional or ICF familiar architect to get started today.